This article was originally featured in the CSAE Trillium Chapter newsletter. In July 2014, Greenfield Services released its most recent instalment of the Pulse Report, a research report dedicated to identifying trends in membership marketing & engagement practices in Canada. This year, 178 association managers, leaders and executives across the country participated in our third annual review of Canada’s association sector. Membership growth, higher visibility in the association’s industry or field, and increased member participation remained consistent as top three priorities in 2013 & 2014. Membership growth has consistently remained over 60% when asking for the top three priorities (62.4% in 2013; 61.2% in 2014); while higher visibility in industry or field pushed over 50% in 2014; and increased member participation remained relatively consistent (48.6% in 2013; 47.8% in 2014). For the third consecutive year, Pulse Report participants identified traditional, outbound functions like public awareness, event promotion to members, and member news dissemination as their organizations’ top uses of social media. Their survey responses suggested their organizations are still making only limited use of social media tools that could help them transform their programs and deepen their member relationships. The proportion of survey respondents with active social media programs actually declined between 2013 and 2014, from 88% to 82.8%. There was a corresponding increase in organizations that expected to delay the introduction of social media programs, from 4.8% to 10.5%. The results also show that Facebook and Twitter are the most commonly-used social media platforms, followed at some distance by LinkedIn groups. Event attendance has grown steadily as an association priority over the three years of Pulse Report research. This statistic has risen from 36.7% in 2012, to 39.9% in 2013, to 43.8% in 2014. Associations are consistently devoting more attention to renewing members they’ve already identified and acquired. That level of attention may be paying off. Associations’ retention rates among first-time members showed steady improvement between 2013 and 2014, with small increases of participants who reported rates above 70%. The results for lifetime retention rates showed a significant jump as well. No more than 56% of associations have marketing plans in place to reach potential new members and offset the impending surge of lapsed members, as the workforce retires. This stat shows that we are OK with working on keeping who we have, but are not focusing on gaining new members. Among those who had something to say about new member recruitment, more than three-quarters (76.8%) said that new members were likely to hear about their organizations through word of mouth. This is good – but not good enough to keep your association viable. Associations are scrambling to recruit and serve new generations of members, and to find the areas of interest where they can engage more effectively. The data indicates that organizations were considerably less likely in 2014 than they were in 2013 to consider new membership models, and are still looking to find the right mix of programs and services to satisfy existing and future members. What has changed in 2015? Are you implementing a new strategic plan, or about to launch a new initiative to satisfy members? Will you look at your recruitment & retention plans to determine if there are any gaps, and if there are, what will you fill them with? 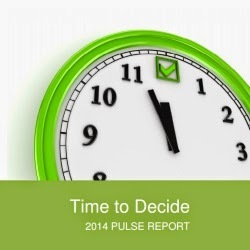 To download the Pulse Report, please click here.